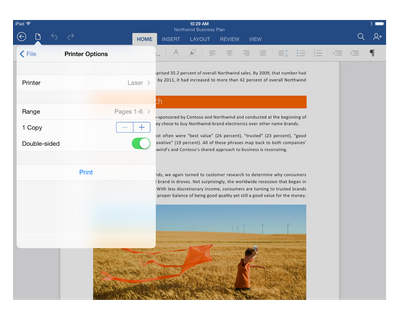 Microsoft Office for iPad has been an almost embarrassing success for its progenitor, comfortably retaining three of the top slots in the iOS app store since its release. For days after release, Word, Excel and PowerPoint were ranked 1st, 2nd, and 3rd. About a month later, they are 1st, 8th, and 15th. Today Microsoft updated the apps with several new features, including the ability to print, something that was sorely lacking in the release of Office for iPad, along with changes to Excel and PowerPoint to better arrange content so that it’s attractive and well spaced. Standard bloviation: Microsoft has spoken ad absurdum about its quicker development cadence, during which we’ll see faster, smaller updates to its software products. Call it a company-wide hastening. This is a decent example of that work.